Fresh off a double win in WSB at Jerez, (courtesy of Marco Melandri), Aprilia has officially announced that it will enter MotoGP next year … a year earlier than initially anticipated. 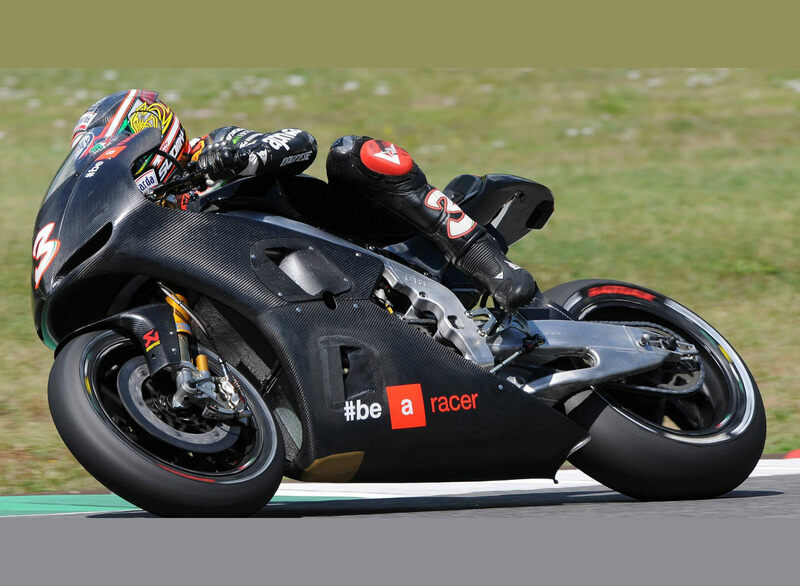 As yet, its riders have not been named, but Marco Melandri is likely one of them. 12 September 2014 – Aprilia (Piaggio Group) officially announced that they will enter the Grand Prix motorcycle racing in the MotoGP class. Great news. I think they will do well this time. he wants to win races in the future, so for gresini aprilia and grandprix this is a problem. A: he’s seen this movie. Great to see. Come on Suzi, Kwaka and BMW- get in the game! Now we just need Guzzi to enter the fray……. Guess they should hire Colin Edwards for fire retardation testing. Fantastic! Best wishes to Aprilia! Awesome job Aprilia. I guess they may be the premier Italian Sports bike brand now! It is exciting to see a small company compete at a high level against the big 4 Japanese and BMW. they’ve already done the homework on that one…. exactly, that’s why Kansas is going bye bye. Whatever became of Ivano Beggio after his foray into Moto GP? At the time, the company spent heavily on Moto GP, then the Italian government decided scooter riders had to wear helmets, hence the 200,000 scooters in the pipeline suddenly stopped selling, causing the company to essentially fail and be purchased by now owner Piaggio Group. I wish him well, even if he is never mentioned. All that WSB success must be getting to their heads! In all seriousness, I am glad to see another manufacturer get into the game. Hope they brought Piaggio’s checkbook. Will they be entering an all new from-the-ground-up prototype? Good deal, another player is always welcome. Good luck to them.